Erma Faye McClement was born September 24, 1917 on Lorimor, Iowa: the daughter of James and Etha (McKee) Cornelison. She graduated high school from Lorimor with the class of 1935. Following high school, Erma attended beauty school and was a beautician until she was married. She was united in marriage to Kenneth McClement on October 18, 1942; he preceded her in death on November 5, 1999. Erma did laundry and delivery service for many years. She was a very strong and determined woman. 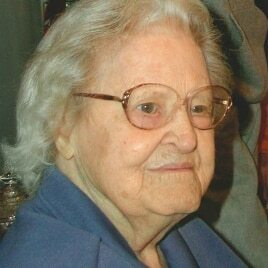 She enjoyed housework, loved kids and babysat her great-grandchildren.Erma passed away at her home on Saturday, August 13, 2016 at the age of 98. She is preceded in death by her parents; husband; a son Jerry McClement and 11 brothers and sisters: Virgie, Roy, Anna, Floyd, Opal, Erma Jane, Merrill, Clark, Lyle, Dale and Merlin. Erma is survived by her daughter Sherry Hackbarth of Waterloo; a granddaughter: Dawn Flockhart; 4 great-grandchildren: Ashley (Jake) Millermon, Shannon Larsen, Abagail Flockhart and Courtney Flockhart and 5 great-great-grandchildren: Brooklyn, Mack and Madilynn Flockhart and Bridget and Mason Monroe. Healgrief has a memorial to share with you. https://healgrief.org/erma-mcclement/ We invite you to express condolences, share special memories and photos and light virtual candles to honor and celebrate the life of our loved one. We also invite you to share this with others who may want to be notified as well. You may do so by sharing the link or by clicking the “Share this Memorial” button from within the memorial itself.